The term 'celebration of life' has entered my personal "turns-of-phrase-I-hate gallery." I understand the sentiment behind the perky spin, but I feel rather tyrannized by the doublespeak. You should laugh and tell jokes and wear bright colours! It's a party! Yay! Someone you love is dead and you will never talk to them again! Now get in line for a whack at the piñata. Mother's Day this year was my first without my mother and with her birthday falling later this week, it is a bittersweet season for me. She died on April 1, a date I am inclined to think she held out for in her decline, knowing her wry, Scandinavian sense of humour. Her funeral was held a few days later, though apparently one is now discouraged from calling it a "funeral." Such things are, we were informed by some very kind people at the funeral home as well as several of the invitees, now almost always referred to as "celebrations of life." You should laugh and tell jokes and wear bright colours! It's a party! Yay! Someone you love is dead and you will never talk to them again! Now get in line for a whack at the piñata. The term "celebration of life" has entered my personal "turns-of-phrase-I-hate gallery," along with such luminaries as "can/can't wrap my brain around" and "in/out of one's comfort zone." Certainly, there was much to celebrate in regards my mother's long -- she died six weeks short of her 93rd birthday -- and productive life. Up until her last days, she maintained all her "marbles," as she called them. I understand the sentiment behind the perky spin, but I feel rather tyrannized by the doublespeak. I keep thinking about the Mary Tyler Moore Show episode when Chuckles the Clown died, having been dressed like a peanut and shelled by a rogue elephant at a circus parade. Where the rest of the WJM newsroom made tasteless jokes about the circumstances of Chuckles' death, Mary stood by in grim outrage. 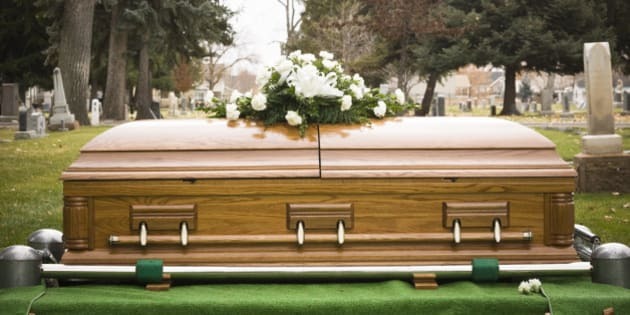 But when the actual funeral began, she giggled through most of it, finally erupting in tears when the minister, far from reprimanding her, encouraged her laughter and reminded her that Chuckles "hated to see people cry." When my father died, nearly 19 years ago, such gatherings were still mostly called funerals, though we told funny stories that day, too. And of course, there were tears at my mother's "celebration of life," but also happy memories: eulogies delivered with pauses in which the speakers made time for laughter and even applause. Mum would have appreciated that as she was blessed with perfect comic timing and rarely spared those around her a zinger when the opportunity came knocking. A year and a half ago one of my brothers died and we called the service we held for him a 'memorial'. Because it was held more than three months after his death, this was generally accepted. I recall, however, that there were a number of 'celebration of life' militants milling about, not to mention a couple of literary experts. I read William Wordsworth's "We are Seven", as we had been seven siblings until my brother's death. I thought it an appropriate choice; in fact, a few months later, David Sedaris' New Yorker piece about his sister's death was published and entitled "Now We are Five". But I was treated to some anti-Wordsworth rhetoric that afternoon: the poem was too low-brow, not to mention too long, I was told by a couple of celebrants of my brother's life. All I could think was that I wished I had carried through with my original plan to read Wordsworth's "Intimations of Immortality". All eleven stanzas. You want 'too long'? I'll give you 'too long'! Everyone's a critic, even in our darkest hours, even as we celebrate life. My mother, in her 90 plus years on the planet, developed an appreciation for all manner of brow -- low, middle and high. A month before she died, she was hospitalized for a few days and I sat by her bed and read to her from Winston Churchill's The Gathering Storm. When I got to Leo Amery's great moment, quoting Cromwell and beseeching Neville Chamberlain to resign, my mother beat me to it, gesturing with her bony fingers (she weighed about 90 pounds at that point) and saying, "Depart I say, and let us have done with you. In the name of God, go." We were in a teaching hospital and the "very young, skinny boy," as my mother called the intern, looked alarmed. (In retrospect, I think he may have thought mum was shooing us out of her room.) I, on the other hand, had just witnessed something familiar: my mother's marbles, still in fighting form. Five weeks later, I was forced away from the familiar and out of my comfort zone when I attended my mother's celebration of life. And now I am trying to wrap my brain around these awful truths: no one will ever again love me unconditionally or warn me that something might poke my eye out.